I write to ask that you require the Virginia Board of Education to end its abiding neglect of its duty to enforce the mandatory attendance laws. Code § 2.2-4013.D authorizes you to object to a regulation during the thirty day period following adoption. [E]very parent, guardian, or other person in the Commonwealth having control or charge of any child who will have reached the fifth birthday on or before September 30 of any school year and who has not passed the eighteenth birthday shall, during the period of each year the public schools are in session and for the same number of days and hours per day as the public schools, send such child to a public school . . . (emphasis supplied). Code § 22.1-98.B.1 provides: “The length of every school’s term in every school division shall be at least 180 teaching days or 990 teaching hours in any school year.” The statute sets out exceptions (e.g., severe weather); those exceptions do not authorize part day absences for any reason not available for full day absences. In short, the law requires attendance for the full school year and the full school day. Code § 22.1-258 requires a school division to investigate every unexcused absence and to take specified actions, culminating with a Child in Need of Services/Supervision petition or misdemeanor complaint against the parent upon a seventh absence. The Board of Education shall have the authority and it shall be its duty to see that the provisions of [§§ 22.1-254 through -269.1] are properly enforced throughout the Commonwealth. In 2010, after I had pointed out that Richmond had been and was in wholesale violation of § 22.1-258, the Board proposed a truancy regulation. Following a series of delays, the Board voted to adopt the regulation on September 27, 2012. I sued over the glaring defects in the regulation and in the procedures for its adoption. Butcher v. Board of Education, No. CL12005348-00 (Cir. Ct. City of Richmond, Petition for Appeal, December 14, 2012). “Truancy” means the act of accruing one or more unexcused absences. The Board filed the regulation with the Regulatory Town Hall on January 30, 2013 and voted to adopt it on June 23 of this year. The new regulation has not yet appeared in the Virginia Register so the thirty-day adoption period established by Code § 2.2-4013.D has not started. 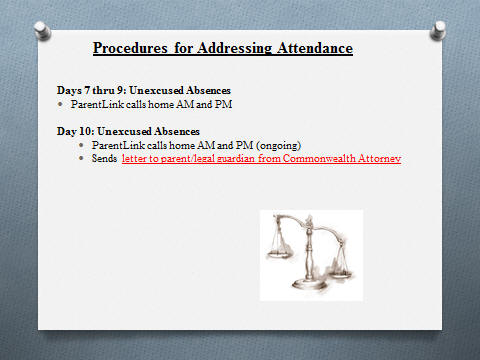 To avoid potential complicating of division data reporting systems and overloading of court cases required by the Code after seven unexcused absences, the proposed definition [of “unexcused absence”] has been amended to missing a full day only. . . . Thus, the Board seeks to evade its duty and the plain intent of the General Assembly in order to simplify data reporting and (in the spirit of ultra vires but compassionate overreach) to avoid overloading the courts. The Board’s reluctance to overload the courts tells us the Board knows that § 22.1-258 is being grossly violated. Thus, it is clear that the Board is deliberately sabotaging the statute it is required to enforce. As reproposed, the regulation would allow a student to attend school long enough to be present at the first roll call and then to skip out for the remainder of the day. Not only is this perversion of the mandatory attendance requirement unlawful, our experience in Richmond shows it to be dangerously unwise. On January 5, 2005, Phillip Hicks stabbed Justin Creech to death near the intersection of Staples Mill Road and West Broad Street. Both Hicks and Creech were students at Thomas Jefferson High School; both had reported for school that morning and then had, as was their custom, left school. As is usual in Richmond, the school was doing nothing to deal with Hicks’ and Creech’s truancy. On June 7, 2012, Antonio Shands was observed by City truancy officers at the Pony Pasture during a morning truancy sweep. Shands and others fled in a vehicle. Shands was killed when that vehicle ran a stop sign and was hit by a pickup truck. More generally, much of our juvenile crime comes from students who are truant. Yet the Board now seeks to license truancy that is forbidden by Virginia law. Indeed, the regulation does not even provide for the collection of data concerning part-day absences. Governor, I ask that you object to this regulation as authorized by § 2.2-4013 and demand that the Board meet its obligation to enforce the mandatory attendance laws. If the Board then fails to promptly discharge its duty, please remove all the Board members and replace them with people who are willing to obey the law. My appeal of the regulation still is pending under an order that allows amendment of the Petition once the Board has completed the readoption. I am not anxious to further delay this regulation but, in light of the Board’s manifest inability to act promptly, I am unwilling to forego my opportunity to demand that they do their job and do it right the first time. Accordingly, if you do not require the Board to repair this regulation I will ask the Richmond Circuit Court to do so.